Nothing is more beautiful than a sweeping lawn. Our lawn care tip collection contains lots of practical tips for lawn maintenance. Transform your lawn and give it the care it deserves. 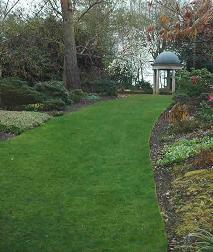 Lawns need regular weeding, watering, feeding and mowing to look good. They also need their edges neatly kept. This sound like a lot of work, but it is easy if you keep to a schedule of regular care. The first lawn care tip; early morning is the best time to water a lawn. An irrigation system makes this task very easy. Mow frequently at a constant height. This maintains a balance between leaf and root growth. Infrequent severe mowing, or constant close mowing, result in shallow roots. This results in weak turf. Weak turf makes lawn maintenance difficult. It is also likely to be invaded by weeds. Avoid mowing your lawn while it is wet. Dry grass is easier to cut. Never leave grass clippings on the lawn. These result in uneven growth and encourage fungal disease. Cut grass makes valuable compost. It contains nitrogen, phosphorus, and potassium. Underfed lawns are pale and have a sparse, loose texture. Weeds easily invade a lawn which has deteriorated like this. The following actions should be done every 3 to 4 years. Also do them if your lawn has lost condition. Do it just before or in early spring. Organic lawn care is done by spreading organic compost over the scarified lawn. Spread the compost 1 to 2 cm thick. It should be thick, but also thin enough for the blades of grass to grow through. Water the lawn well after applying the compost.